Our Youth Employment Program is at the heart of all that we do and we’re very proud of it! 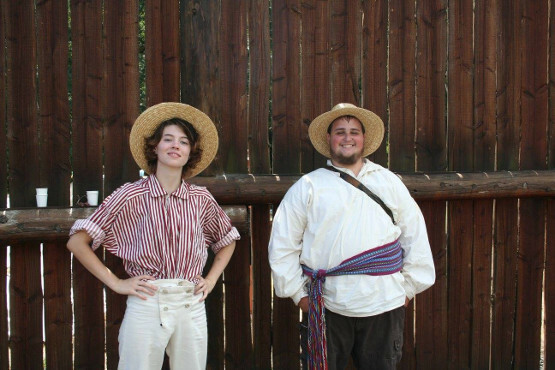 Each summer, we hire local high school students to work as tour guides in the Butterfly Pavilion and Fort Umpqua, help maintain the gardens, and staff the Outpost Café and Produce Stand. We are the largest source of off-farm employment for young people in our area. YEP jobs provide our youth with essential work experience and prepare them for success later in life. At the same time, the wages they earn ripple through our rural economy, helping to build a stronger community. Students in our Youth Employment Program get experience with horticulture, tourism and customer service, developing highly transferable job skills. Students apply for these select positions, gather references and go through an interview process, gaining important job-search skills. Each student works with an experienced mentor / supervisor, and an AmeriCorps Job Coach to help them master the skills needed to do a good job. Our students are the best ambassadors for ECEC and Elkton–be sure to say hello when you’re in the butterfly pavilion, Fort Umpqua, cafe and produce stand! Looking to join our team for the 2018 summer program?